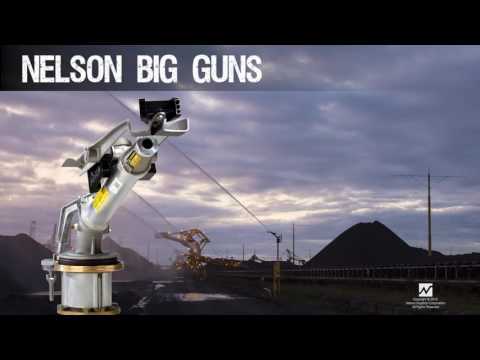 The rugged durability of Nelson Big Gun® Sprinklers makes them a favorite for mining dust suppression. Big Guns are preferred because of the ability to move a large amount of water in a short time. The large nozzle is less likely to plug and the filtration requirements are minimal. All bearings on the gun are sealed ball bearings. Some sprinklers are mounted on high towers in order to throw over the piles. Alternatively, a high trajectory Big Gun sprinkler (fixed 43° and adjustable 15°-45° models available) can achieve the necessary stream height to reduce tower height and clear the top of the piles. A clear winner in the fight to control fugitive dust issues for tailing dams, heavy haul roads, stockpiles, aggregate terminal, erosion control and air quality. • ANODIZED, POWDER COATED, and STAINLESS STEEL BIG GUNS for sprinkling with corrosive waters. • WEDGE INSERT for modified trajectory. Using Big Guns and 800 Series Control Valves in conjunction with Nelson's Control System allows mining operations to automate irrigation for scheduled fugitive dust suppression. Two other mining industry concerns addressed by Nelson products are dust suppression of truck routes and leach mining. Rotator® Sprinklers on portable poly systems with stake and tubing assemblies are a simple fix for wetting down a heavy haul road. The high uniformity, light application rate of the Rotator keeps dust in check without creating mud bogs. The high uniformity of the S10 Spinner with its gentle, rain-like droplets makes it a great choice for leach mining and tailings dam applications. Please contact your Nelson representative for more information on mining applications and fugitive dust control, as we have many customizable solutions.